From 26 December 2018 to 25 January 2019, I visited AMDA Malino Farm in South Sulawesi to carry out periodic monitoring on an ongoing farming project. Dedicated to producing healthy and eco-frinedly produce, the farm has helped organic agriculture to take root in the locality. At AMDA Malino Farm in Batulapisi on the island of South Sulawesi, Indonesia, the local farmers are keen to cultivate organic vegetables and fruits besides making rice. The innovators who started growing organic lettuce after purchasing its seeds in Makassar (the region’s capital) were Mr. Thalib and Mr. Jamal. The two influenced others to have a go at applying organic methods in making crops other than rice. Until now, the farmers have planted mustard plants, carrots, onions and cabbage in their fields. In mid-April, I paid a visit to Malino’s Batulapisi district in South Sulawesi to monitor the AMDA Food Program, a program to promote (active) organic farming. Before visiting the farm, I dropped by a local supermarket in Makassar, the provincial capital, to do a little research on how AMDA’s organic rice has been sold. 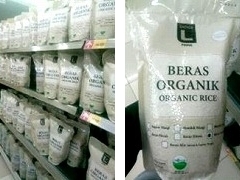 One bag of rice was priced at 66,599 IDR (roughly 530 JPY or 4.80 USD) per two kilos. Since 2012, AMDA staff have been making courtesy visits to the diplomatic offices in Japan to hand over agricultural produces (organic rice and rice cake-‘mochi’) harvested from AMDA Notoro farm and Shinjo village. This year, AMDA sent the organic produces to about 13 Embassies and Consulates in Tokyo and Osaka and reported the progress on AMDA Food Program in Shinjo village during courtesy visits to some of the Embassies.